Igor Dyatlov, a fifth-year student at Ural Polytechnic Institute, was leading a group of men and two women on what was to be a 16-day, roughly 200-mile trip. 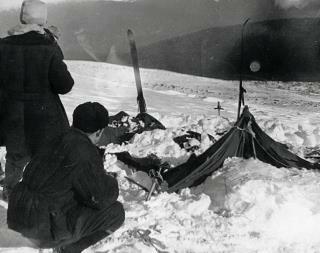 All were described as experienced hikers, and journals found after their death recorded what sounded like an ordinary trip. When the group wasn't heard from, a search was organized and began on Feb. 20. Six days later their tent was found—sliced open from the inside. Listverse reports warm clothing, compasses, axes, and knives were left behind in the tent. The next day, two bodies were recovered, roughly a mile away, clad only in underwear, and by a campfire. Three more bodies were recovered shortly after; the other four emerged in May when the snow melted. Explanations could range from "someone put LSD into the dinner" to BigFoot or Aliens. If they figure it out, would be interesting. I think the BEST they can do is Theories. What was the group's view of their Soviet masters? Lenin? Stalin? Deceased by then, of course, but holy icons nonetheless who MUST have had to have been still respected and revered in their society, but, with a group, given heady freedom into the wild, could all but one or two have strayed into ribald apostasy, angering the loyalists? No mention of the picture found? No mention of the journal found?